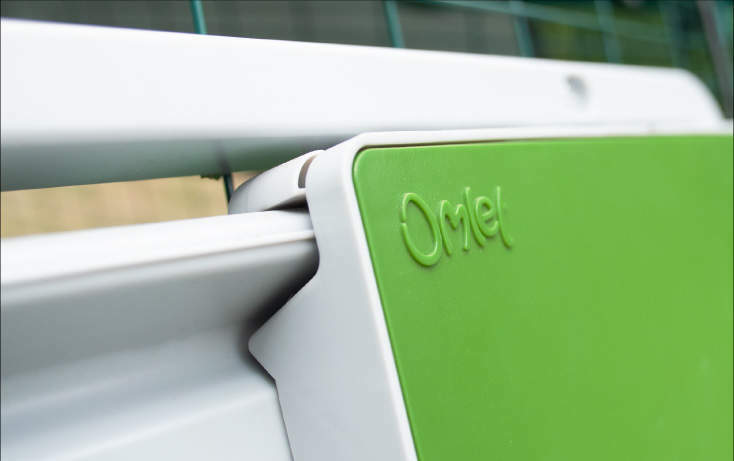 Introducing Omlet's first ever Automatic Chicken Coop Door - the safest and most convenient way to let your chickens in and out of their coop has arrived! 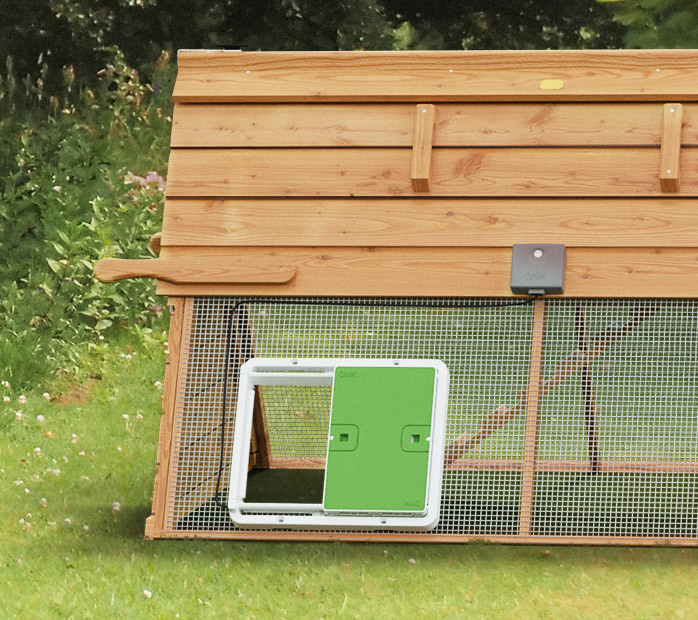 Designed to work with any wooden chicken coop, it can also be attached directly to the Eglu Cube Mk1 and Mk2. 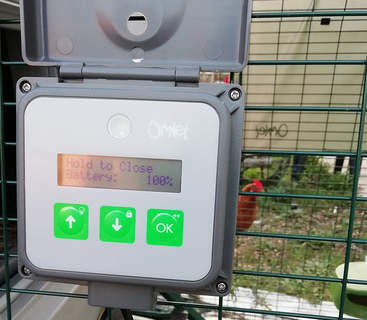 Omlet's automatic chicken coop door opener is battery powered and combines both a timer and a light sensor, giving you the ultimate options for flexibility and control. 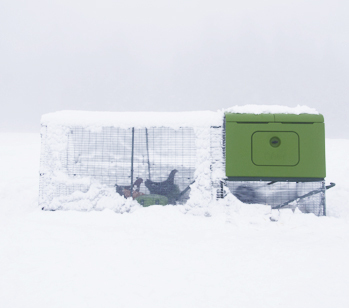 The unique integrated frame and door design can be easily attached to your chicken house or run and has been tested to work down to -10degC. 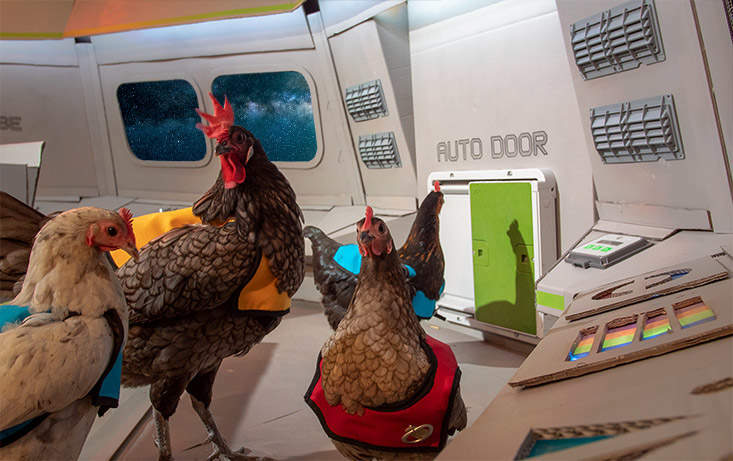 Like a personal chicken coop concierge, the Autodoor will always make sure your chicken’s coop is securely closed at night even when you’re running late. 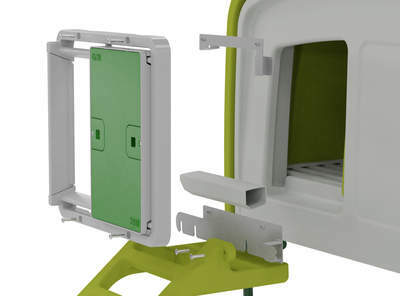 Your Autodoor comes with everything you need to attach it to a Mk2 Cube or a Wooden Coop. If you want to attach it to a Mk1 Cube, an Omlet Run, or traditional chicken wire you will need one of the attachment kits below. 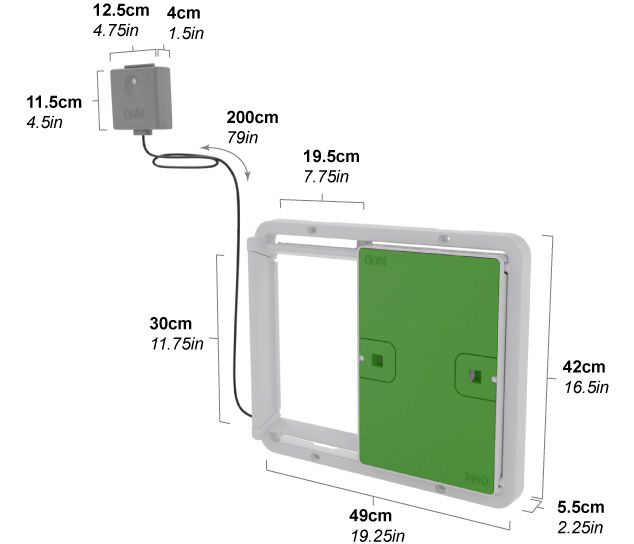 There are also kits to attach the control panel to the Mk1 or Mk2 Cube house. 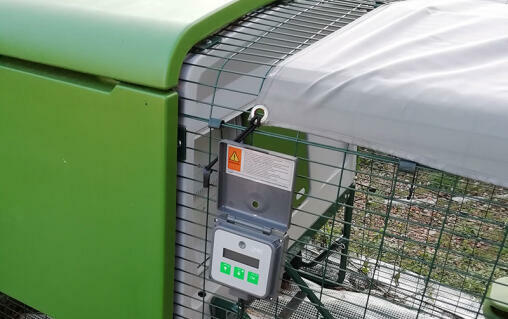 The Omlet Automatic Chicken Coop Door has a powerful electric motor and metal gear that is directly mounted on the door frame for maximum security. 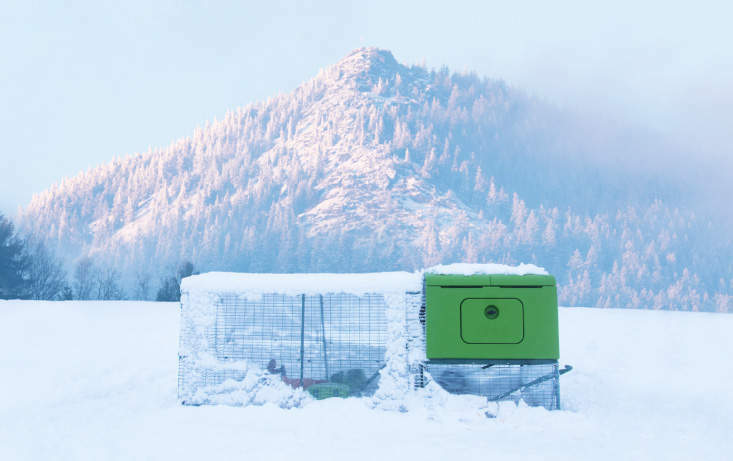 Unlike other automatic chicken coop door openers that work on a string and pulley system, the Omlet Autodoor cannot be simply lifted up when shut. This means that predators will not be able to move the door when it is closed, no matter how hard they try. 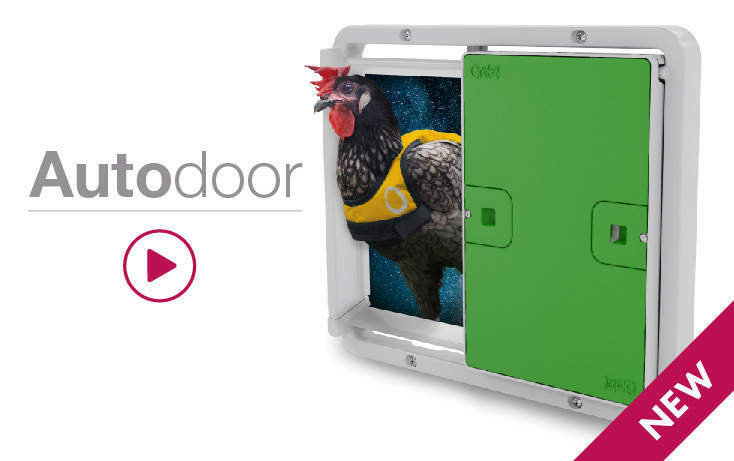 Your chickens can sleep soundly knowing they have the most secure automatic door in the world. 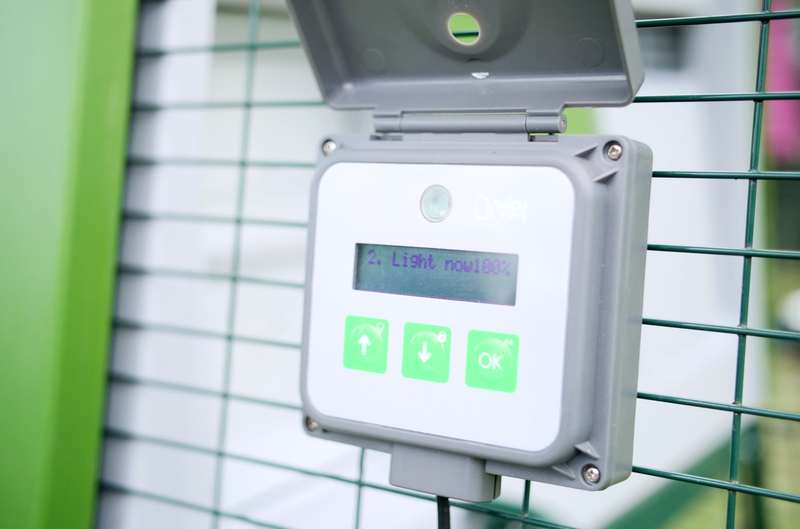 Omlet's Automatic Chicken Coop Door can be set to close at dusk and open at dawn. 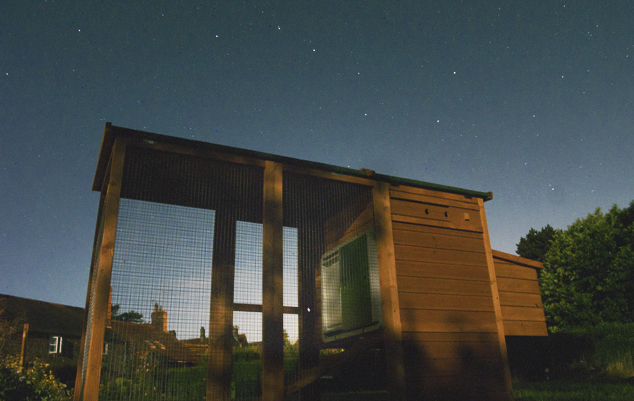 This setting will naturally follow the seasons, ensuring that your hens are safely tucked up when it gets dark and, as the days get longer, the Autodoor will make sure your hens can get out of bed, even when you're enjoying a lazy weekend lie-in. 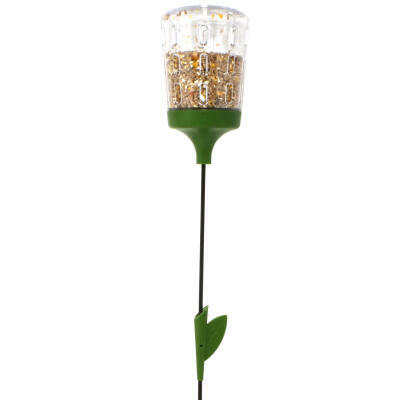 The light setting uses a sophisticated light sensor to automatically open and close the door at a specific and adjustable light level selected by you. 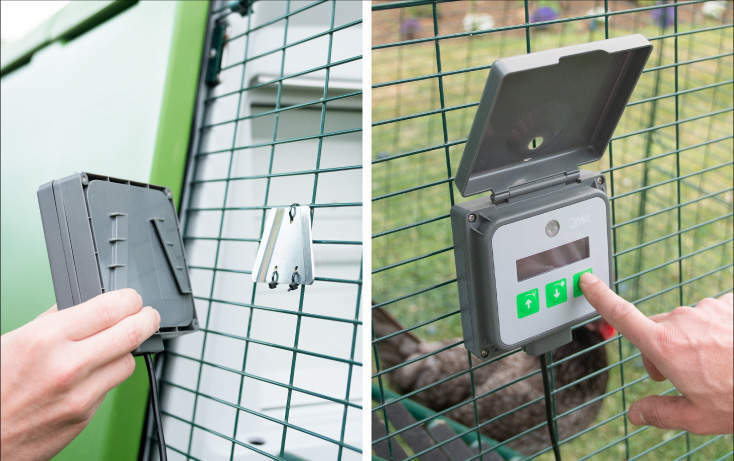 An optional time delay can be added so that the door operates up to an hour after dawn or dusk to suit your flock’s routine. The light sensor has built-in intelligence to recognise and ignore temporary illumination from a security light or torch and will only open after a consistent period of light above the threshold set by you. 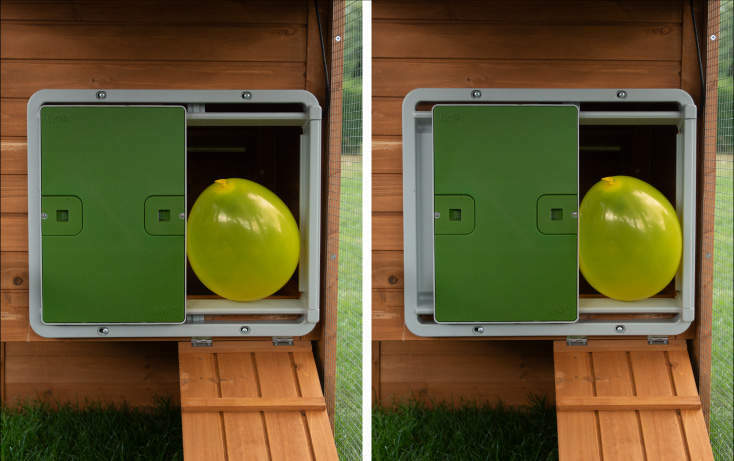 This ensures that your chickens stay safe and protected at all times and, unlike other less advanced automatic doors, you won’t have any unwanted openings in the middle of the night. 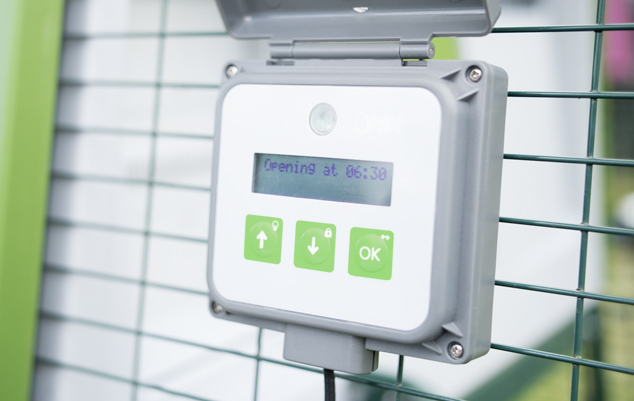 Another way to operate the Omlet automatic chicken door is by using the time setting. This allows you to set an exact time for the door to open in the morning and close in the evening. 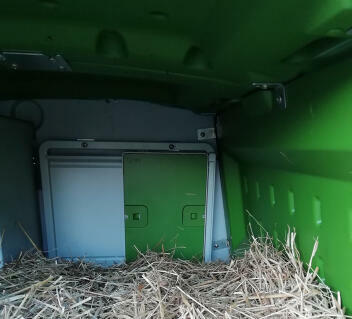 The advantage of this setting is that you have complete control over your chicken’s environment and you can set the Autodoor to meet your specific daily requirements. The control panel also has a manual function which allows you to open and close the door independently of the time or light settings and, for total peace of mind, there is a built-in failsafe system for opening the door completely by hand. 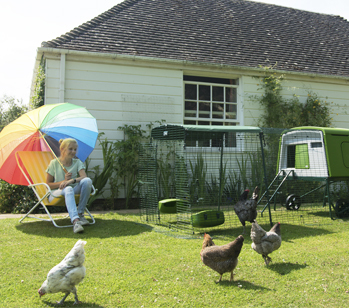 The Autodoor is designed to fit directly to the Eglu Cube chicken coops. 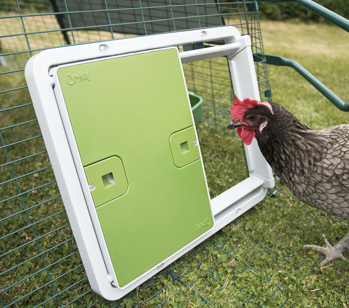 If you have an Eglu Cube Mk2 it will already have fixing points built into the front face and installation will only take a few minutes, while for Eglu Cube Mk1 customers a fixings pack is available to fit the automatic chicken door securely to your coop. 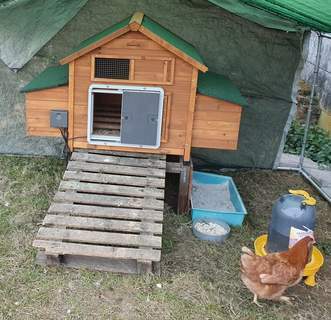 In both cases you will not need to remove any parts or modify your Eglu Cube as the automatic door fits seamlessly into the design of your coop and your original Eglu door can continue to be operated with the Autodoor in place. 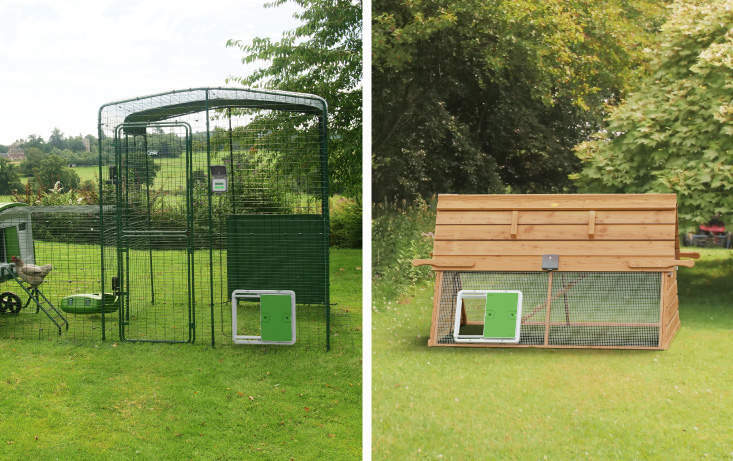 The versatility of the unique frame and door design allows you to fit the Omlet automatic chicken door to any kind of chicken run, where you can choose to have the door opening to the left or to the right depending on which way round you decide to fit the frame. 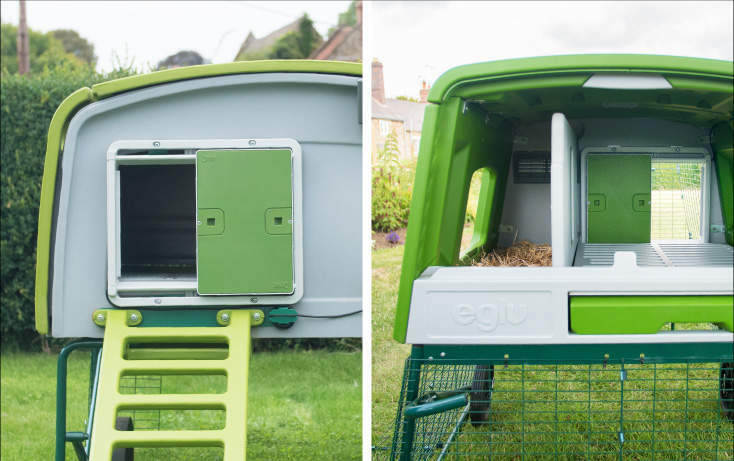 You can attach the automatic door to the Omlet Walk-in-Run as well as the run for the Eglu Go, Eglu Go Up and Eglu Cube chicken coops. 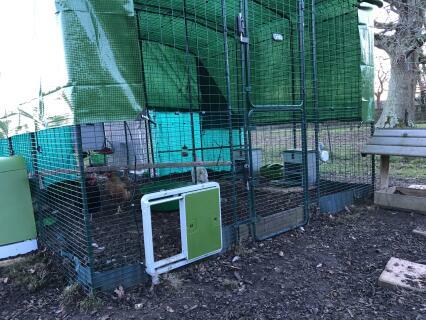 You can also fit the Autodoor to traditional mesh style runs so if you have a homemade coop and chicken run the automatic door will make a great addition to your setup. 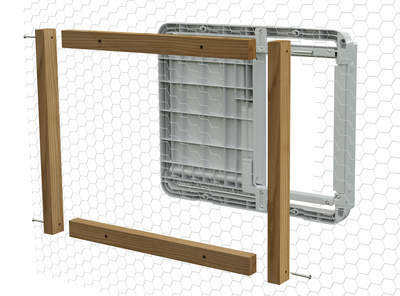 Step-by-step instructions are provided on how to fit your automatic chicken door to all different types of mesh. 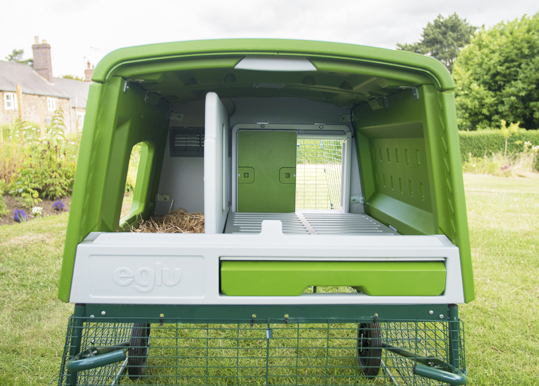 The Autodoor can be fitted to all types of chicken run, including Eglu Go and Eglu Go Up chicken runs. The Autodoor is fully compatible with the Omlet Walk In Run and can be fitted so the door opens to the left or to the right. 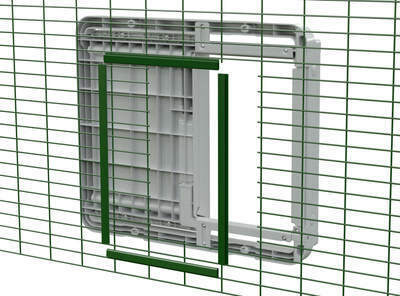 The door can also be fitted to traditional style chicken mesh as shown here. 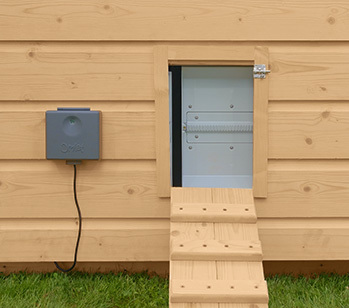 Owners of wooden chicken coops can also benefit from the Omlet automatic chicken coop door opener as it is compatible with virtually any design of wooden coop. 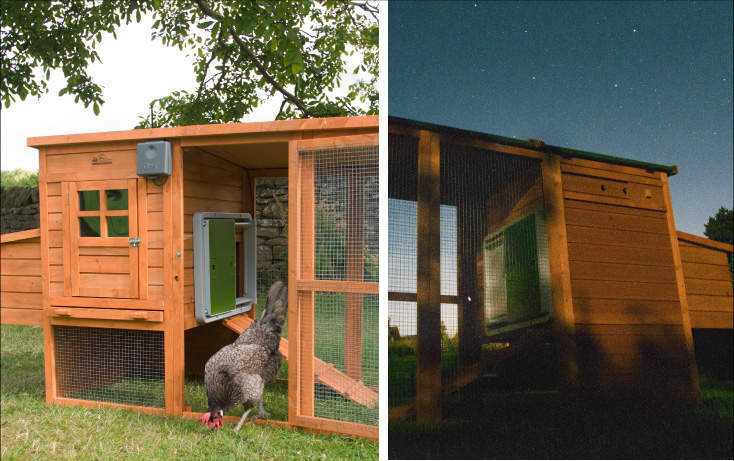 The design allows the automatic chicken door to be fitted either way up so that the door opens to the left or to the right, depending on which option best matches the configuration of your wooden coop. 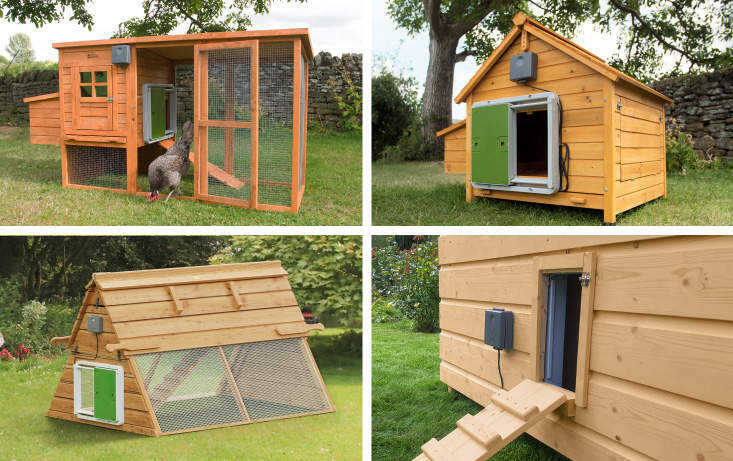 Not only is the Autodoor a great practical addition to a wooden chicken coop, it is also a significant upgrade on traditional wooden doors in terms of insulation, security and durability. 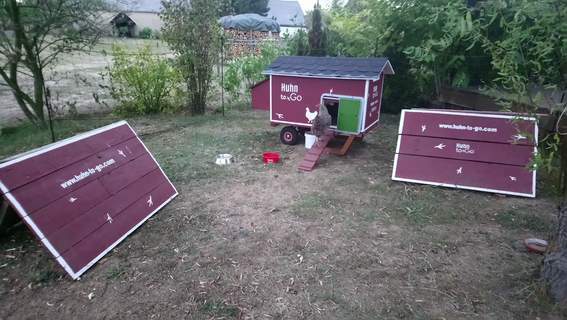 Clear instructions are provided on how to fit the automatic door directly to your wooden chicken coop quickly and securely. 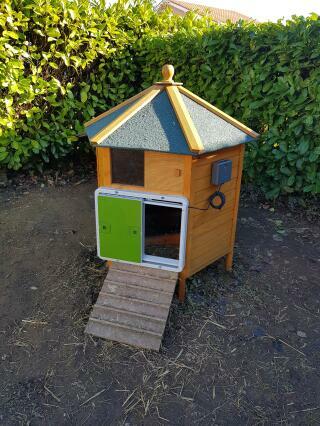 The Autodoor can be fitted to the inside or the outside of your wooden coop. 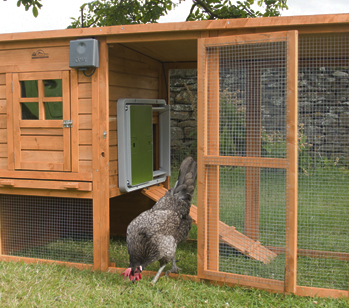 Instantly upgrade the security and insulation of your wooden chicken coop by fitting the Autodoor. 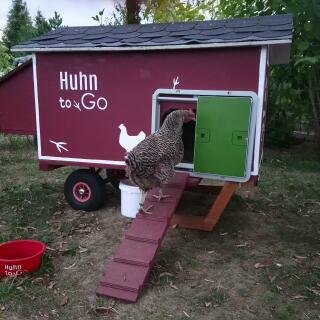 Clear instructions are provided on how to fit the Autodoor directly to your wooden chicken coop. 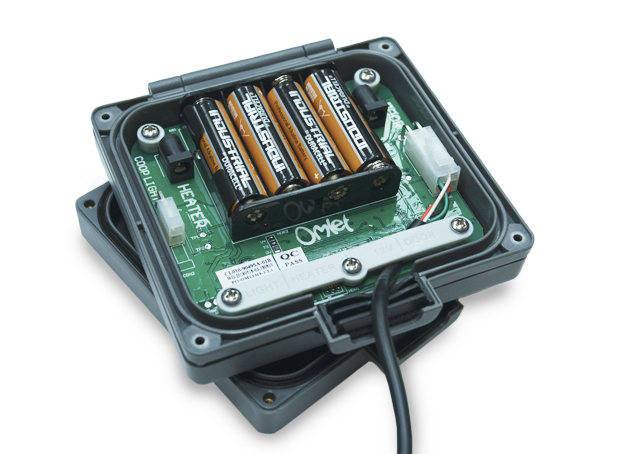 Four AA batteries are all that is required to power the Omlet Autodoor, negating the need for a nearby power source and additional wiring. The door has been endurance tested under battery power and you can expect a set of batteries to last for a minimum of 6 months. 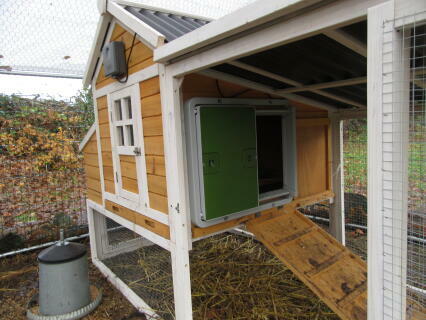 Please note that batteries are not supplied with the automatic chicken coop door. 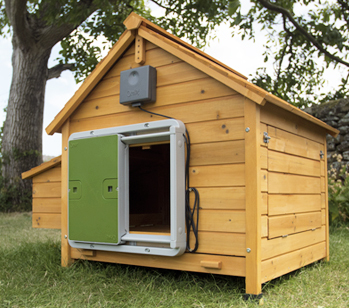 The Omlet Autodoor Chicken Coop Door has unique built in safety sensors that work in the same ways as lift doors. 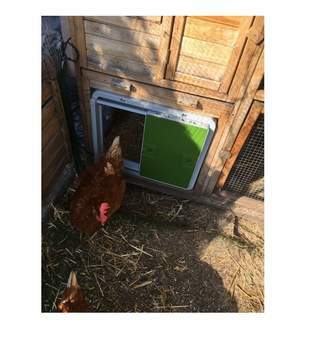 The sensors help detect if any chickens are in the way of the door when it is gently closing. 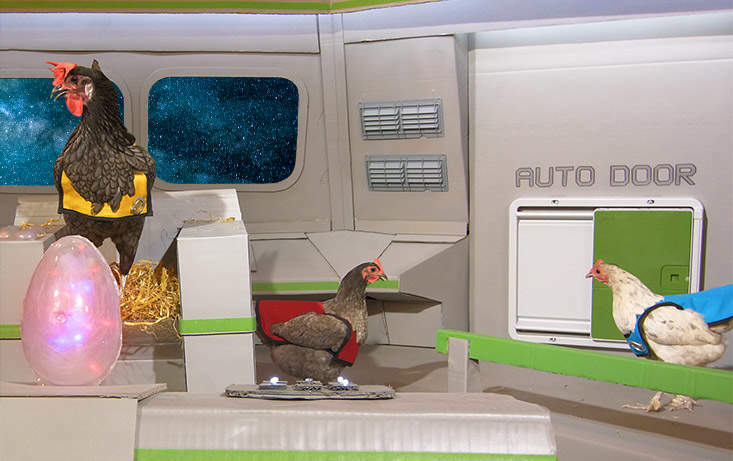 So, if you have a sleepy chicken resting in the doorway then one or both sensors will help detect it and and the door will open again to allow the chicken to move. The door will then automatically try to close again until there are no feathery obstructions in the way and your chickens are all safe inside the coop. 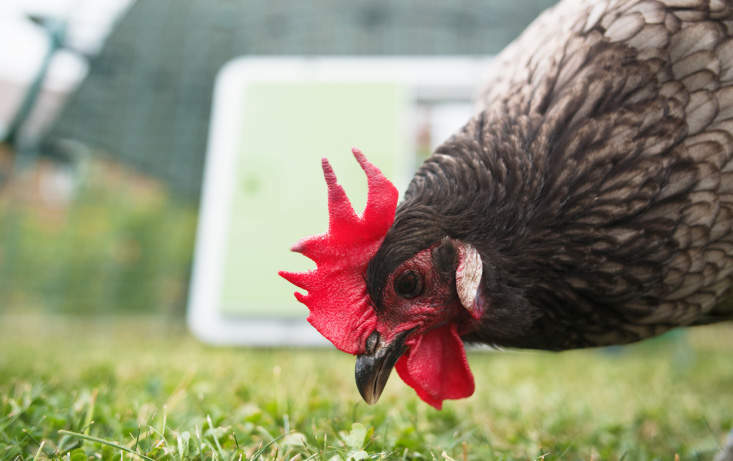 The Omlet automatic chicken door has been engineered to work reliably and dependably through the harshest of conditions. 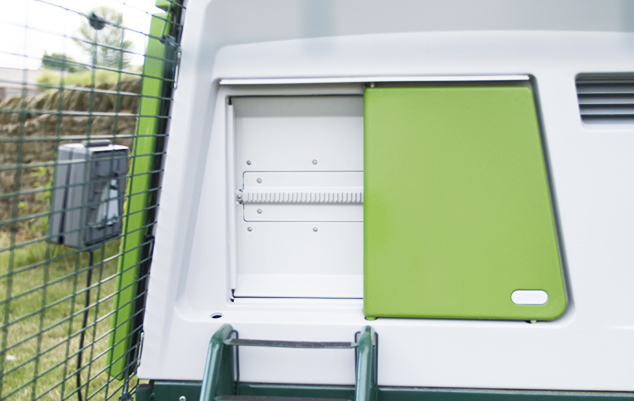 The weather-proof casing of the Autodoor and the control panel ensures the electronics, motor and gear are safe from the elements. The door has been rigorously tested in extreme conditions down to -10 degrees Celsius / 14 degrees Fahrenheit. The weather proof casing of the automatic door protects it from the elements so you can rely on it in any weather. The Autodoor works reliably through all four seasons. 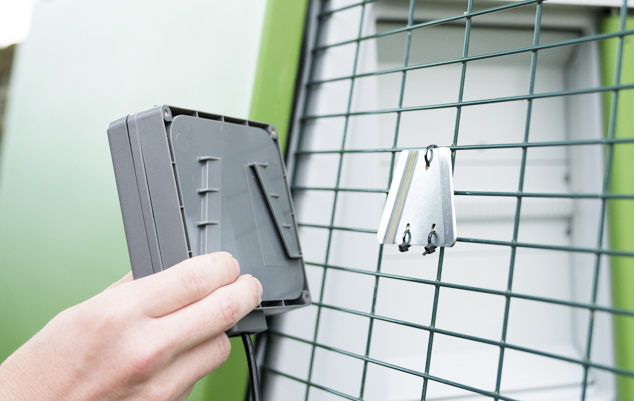 The Autodoor has been tested for reliability in extreme conditions down to -10 degrees Celsius / 14 degrees Fahrenheit. 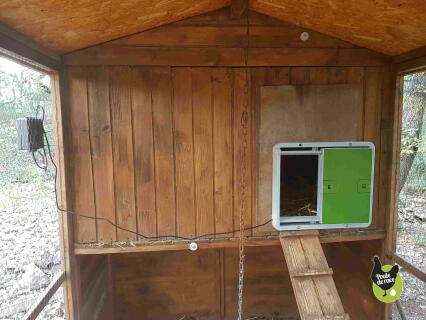 One of the great features of the automatic chicken coop door opener is that the LCD control panel is separate from the door itself and is connected via a durable cable. 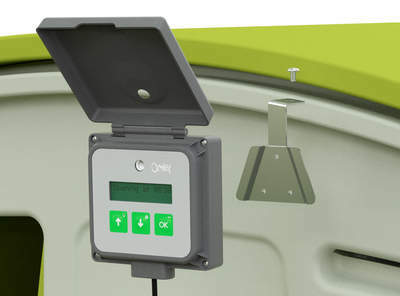 This means that you can place the control panel, which features the light sensor for the coop door, anywhere on your chicken coop or chicken run. Not only is the control panel easy to use, it is neatly enclosed in a triple weather-proof casing for durability and will look great as part of your setup. 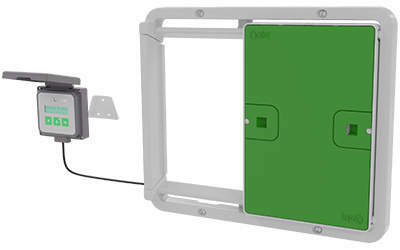 The control panel comes with a bracket to make installation quick and easy wherever you choose to position yours. 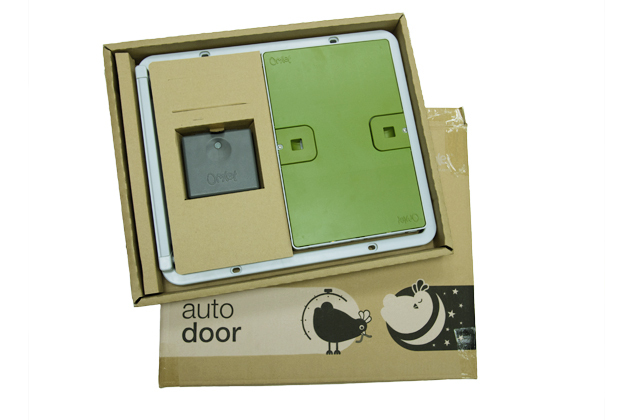 The Omlet Autodoor comes with everything you need in one complete package and the unique integrated frame and door assembly means you have minimum assembly. 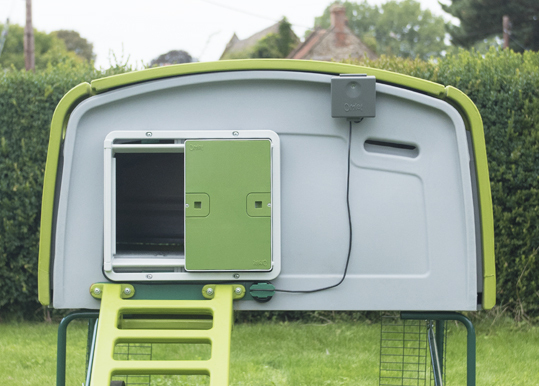 Screws and fittings are included in the box for attaching your automatic chicken door to either an Eglu Cube Mk2 or a wooden chicken coop of any design. 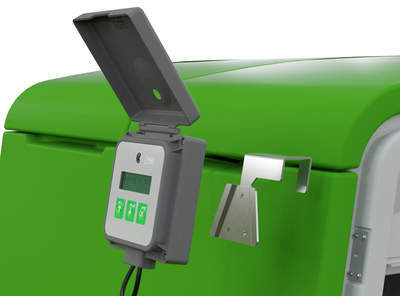 Simply install 4 AA batteries in the control panel and connect it to the door unit using the cable, press the on button and it’s ready to go. Love this auto door. Very easy to install. I put it on the mk1 cube to start with then moved it to the run. Has made my life much easier! I would highly recommend this automatic door. 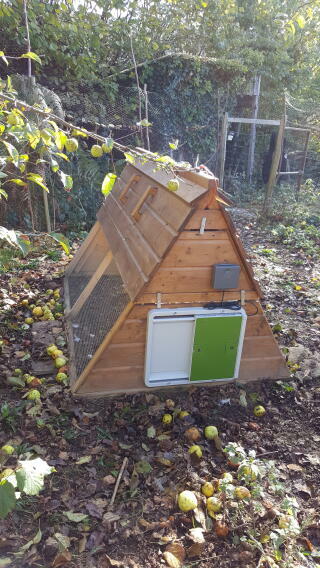 I've got a wooden chicken coop and wanted to add an automatic door opener to it. Fitting didn't take a long as I thought and I'm really happy with it. 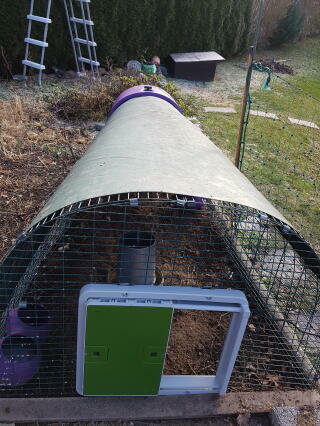 I had to remove the old wooden door off the front of the coop first and then screwed omlet door on. 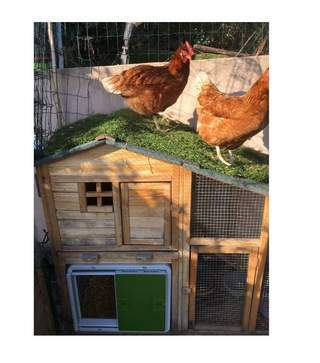 The chickens have got used to it and it works really well. Only issue was the slight delay on the delivery but it arrived before Christmas which was good. Thank you. First of all I should say how impressed I am with the auto door. It's just awesome! I'm not a natural when it comes to engineering and assembly but it only took me an hour to install the auto door on my own. Well, to be honest, with a little assistance from the chickens who all decided to see what I was up to. Maybe using the treats bowl to hold the screws and bits wasn't the cleverest idea I've had! The control system is easy to set up but I'd suggest owners check the mechanism has functioned as expected the first time. 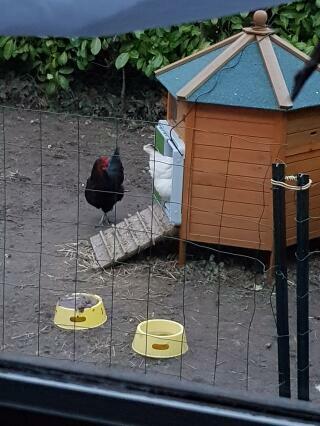 On the first evening one of our hens was locked out and looking very sorry for herself. I changed the light level at which the closing system activates from 5% to 3%, which is perfect for our situation. These settings will vary depending on where the sensor is situated, shade etc. 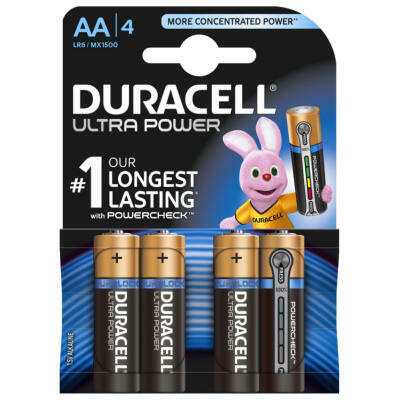 Battery power usage is very low, I expect we'll get at least a year from a set of Duracell rechargeables based on my measurements. The door opener makes life a lot easier. No more getting up super early to let the girls out in summer (I am not a morning person) for a start. If we're out and don't get back for bedtime, it's not a panic. The girls will be safe and sound behind the door. 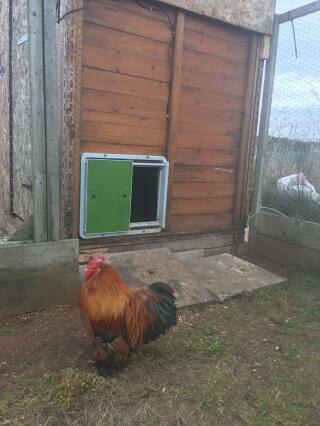 Talking of safe and sound, a friend of ours had an automatic door on his coop that opened vertically. All went well until the local fox managed to open the door by lifting it. 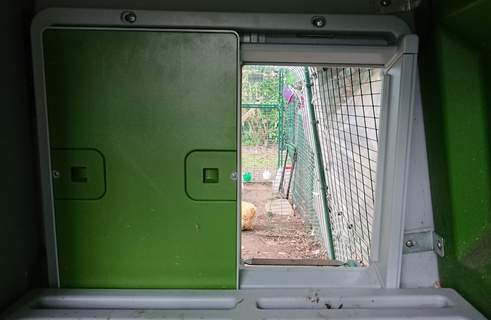 The Omlet sideways opening door is totally secure from Mr Fox, just like the manual door. 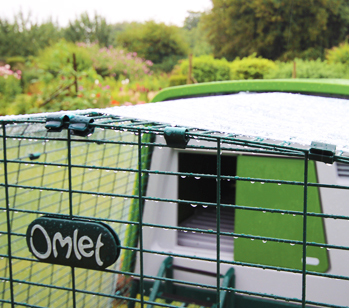 As with the rest of the Omlet range, it's a well thought out product that just does the job properly without any fuss.